When Michael Friedes was a kid, he convinced his parents to move out of their New York City apartment so he could design a space for them from scratch. It should be no surprise then that decades after that initial dive into interior style, Friedes is an award-winning designer with over 20 years of experience. 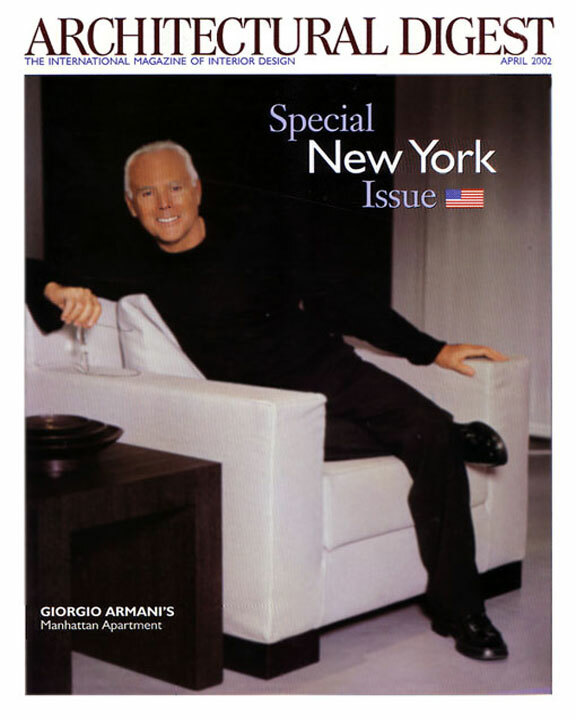 After graduating from New York University, Friedes worked for brands including Giorgio Armani, and designing home furnishings for Ralph Lauren Home. Friedes also became the Design Director at Pottery Barn Kids, where he gained invaluable experience designing furnishings such as lighting accessories, beds, chairs, tables and storage. ‘I love curating livable spaces infused with unexpected layers of color and texture to achieve an inviting sense of warmth.’ -Michael Friedes. 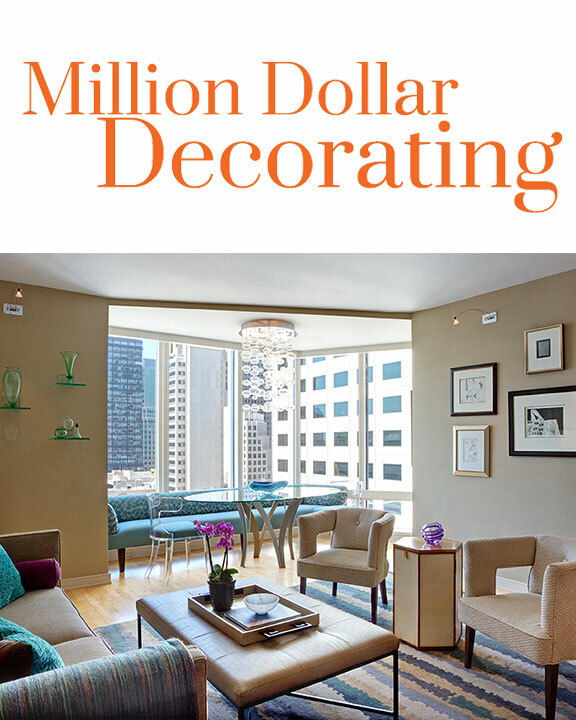 NYS: What are you known for as an interior designer? Michael Friedes: I love curating livable spaces infused with unexpected layers of color and texture to achieve an inviting sense of warmth. I personalize these spaces with pieces from a homeowner’s collection, curated art, and vintage finds that remind me of their aesthetic. By focusing on designs that are honest to a homeowner’s personality, I find that clients inspire me to design beyond their own ideas that they wouldn’t have imagined. NYS: What drew you to the field of interior design? Michael Friedes: From a very young age, design has always been a driving force in my life. As a child, I managed to convince my parents to move to a new apartment so that I would have a blank canvas to decorate. I really wanted to have a say in what our home looked like because I have always believed that where you live is your most personal, intimate, and sacred space. 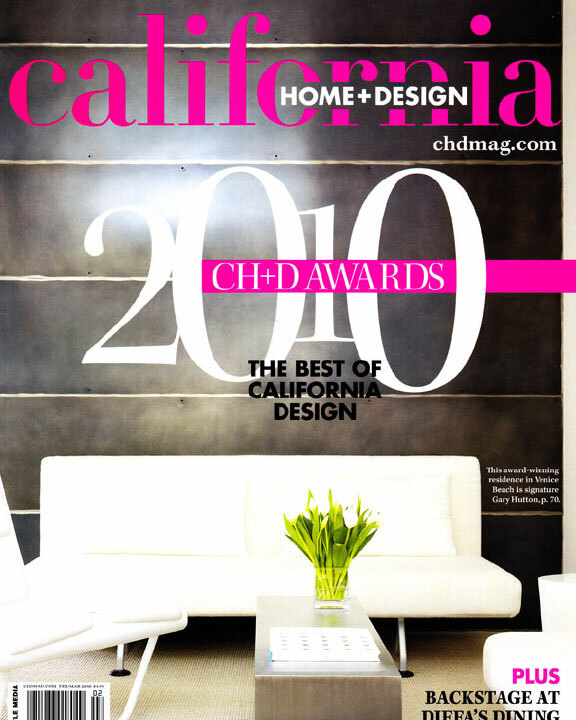 Great design impacts your sense of being, and I love transforming my client’s spaces and creating that feeling for them. I didn’t choose design; it chose me. 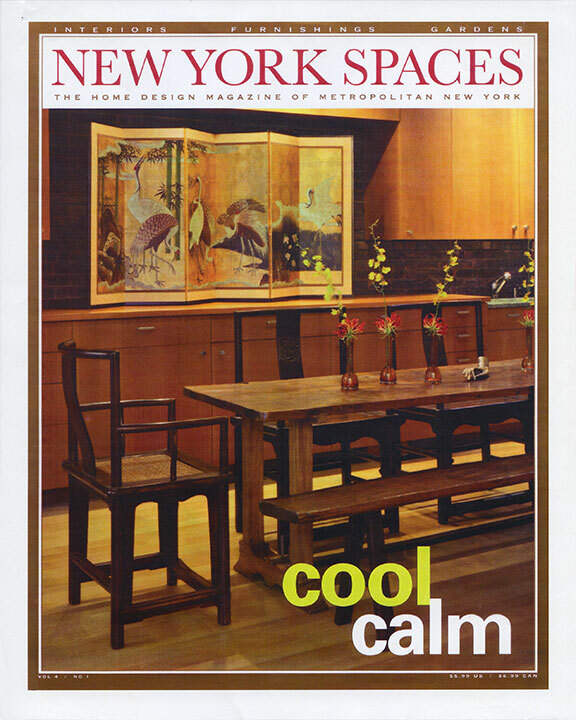 NYW: How did transferring from the East Coast to the West Coast affect your design sensibilities? 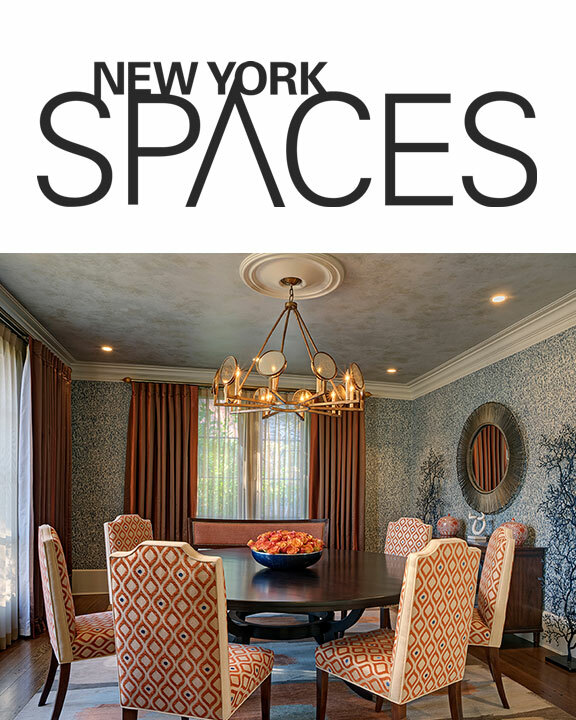 Michael Friedes: Growing up on the Upper East Side of Manhattan, I developed a classic East Coast design sensibility of tailored and refined interiors. New York City is more formal way of living compared to California, and I love the character and bones of the older homes I grew up in. After moving to the West Coast, I started gravitating towards a fresher, more relaxed aesthetic with clean lines and organic elements. My recent project in Noe Valley reflects the ethos of organic textures, keen attention to detail, and bringing the outdoors in. My clients appreciate that after living and designing homes on both coasts, my aesthetic blends polished New York sophistication with a relaxed California vibe—the best of both worlds! NYS: What has been one of your favorite projects to date and why? 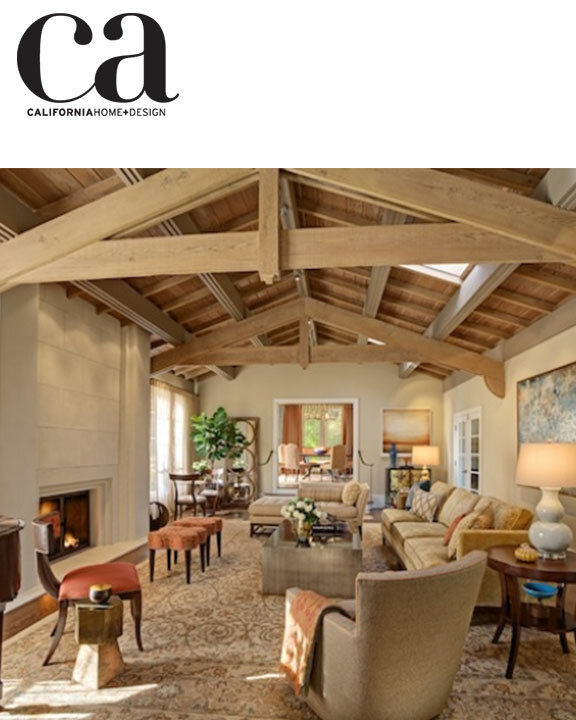 Michael Friedes: One of my favorite projects to work on was a beautiful family home in Orinda, California, and I loved solving their challenging living room while still creating a sophisticated space. The homeowners wanted a multifunctional space for relaxing, entertaining, watching sports, and dining together as a family. To complicate matters further, the husband wanted a big screen TV, while his wife did not want a visible television anywhere in the room. To conquer this issue, I designed a new fireplace wall, and within the new concrete façade housed the large screen TV concealed under a motorized panel. There are also state-of-the-art mini-speakers hidden throughout the room so the room serves as a full home theater for movie watching. I incorporated the homeowner’s beautiful baby grand piano, a stunning chaise that does double duty as a loveseat for when they are entertaining and also a great comfy spot to read or watch TV on. In the corner by the tree is a round glass table and two chairs in front of the window that act as a great spot to sit with a cup of coffee, or play games and do puzzles (a big activity for this family). The other key piece to successfully creating a multifunctional space is having flexible and plentiful seating for all different kinds of entertaining. In this particular space, I layered the room with ottomans for extra seating and many complimentary pull-up chairs for larger gatherings. 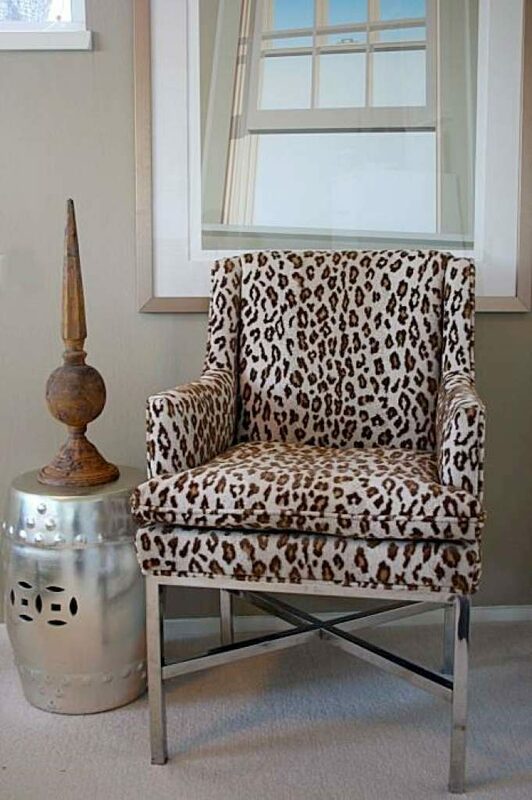 The swivel chair is key as it can face the television, sofa or piano. 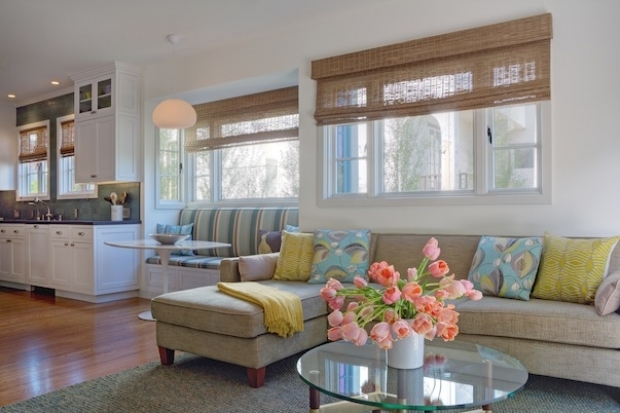 The large custom sofa easily accommodates three to four people or serves as the perfect spot for a nap. Everything is professionally stain-treated, enabling the homeowners to serve appetizers or snacks on the coffee table before dinner is served. All proof that function and design can successfully co-exist. NYS: If you have a blank canvas, what comes first? Furniture, lighting, art? Michael Friedes: For me, it totally varies by project. I don’t subscribe to any one formula. I think about how and where I’m going to find the inspiration for the project or room. It can be anything from a beautiful fabric or rug that catches my eye, or a piece of art from the homeowner’s personal collection. Other times, the inspiration comes from how I want the space to function or what kind of emotion I want to exude. For the room I designed at the Children’s Support League showcase house, I was inspired by the space’s challenging shape. 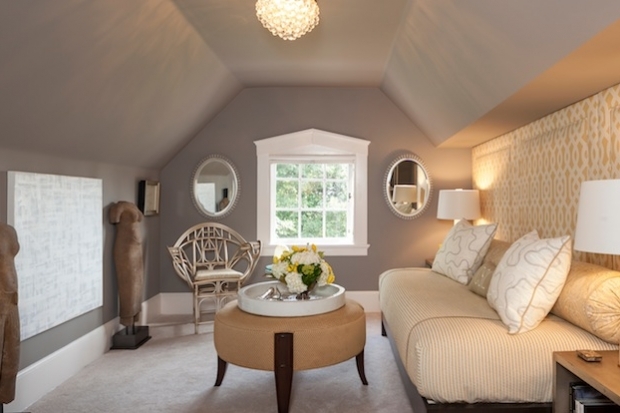 I upholstered the wall and used soft buttery greys, yellows and creams as the color palette to unify the angles and create a cozy, relaxing retreat. NYS: What are some of your go-to sources? 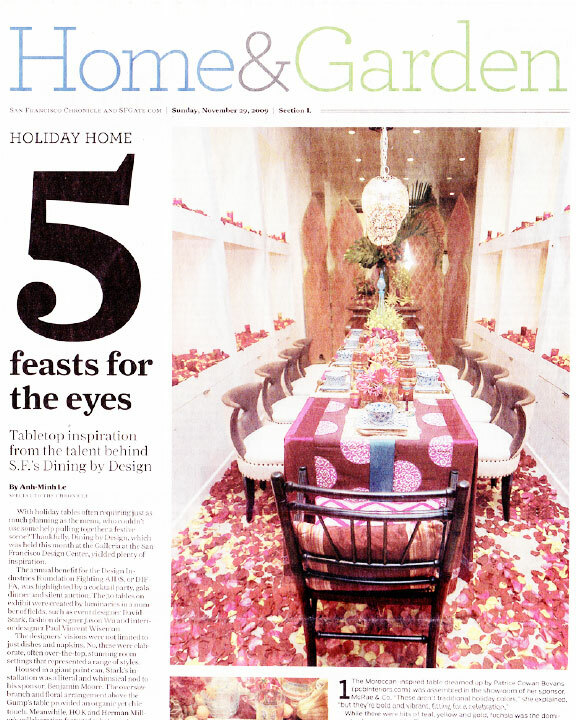 Michael Friedes: Kravet and Duralee are my go-to sources for textiles. 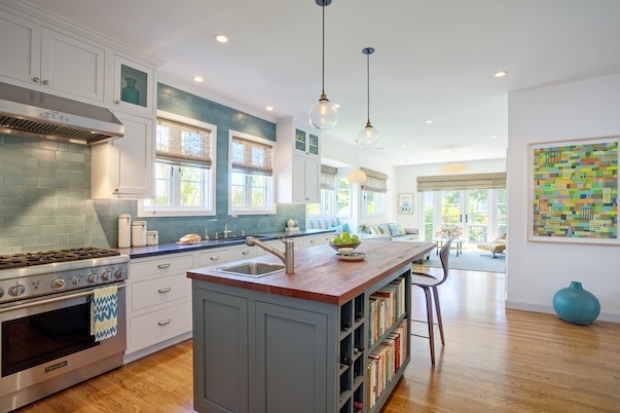 I love their mix of styles and wide range of color assortments. I can always find the perfect fabric to add a pop of color to any space. Bernhardt is one of my favorite places to shop for furniture. You can’t go wrong with high-quality pieces with timeless appeal. I’m especially drawn to their design sensibility as it echoes the clean lines and tailored look that I like to incorporate in a home. For most of my kitchen renovations, I use Cambria for solid surfaces and counters since their materials perfectly fuse beauty with function. They do such a beautiful job of mixing patterns and colors within the material so very few people realize that it is not natural stone. NYS: What would a dream project of yours consist of and where would it be located? Michael Friedes: As a native New Yorker, I’ve found that you can take the boy out of New York City, but you can’t take New York City out of the boy. Realizing this, my plan is to open an office in Manhattan within the next year. This would also bring me closer to my dream of totally redesigning a prewar apartment with all of the original detailing on the Upper East Side and reimagining it with a modern twist. 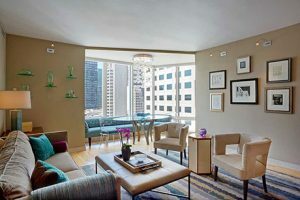 I would infuse the space with gorgeous contemporary art mixed with a relaxed California vibe for today’s living. NYS: Who or what has been an incredible influence in your career? Michael Friedes: My father Harry has been an unbelievable influence in my life, particularly with my foray into design. As a talented and successful menswear textile designer, he had a sharp eye for detail and a firm grasp on the nuances of color and texture. His refined sense of fashion and design influenced my aesthetic from an early age, and I’m a firm believer that the key to successful design is in the details. NYS: What are you working on now? 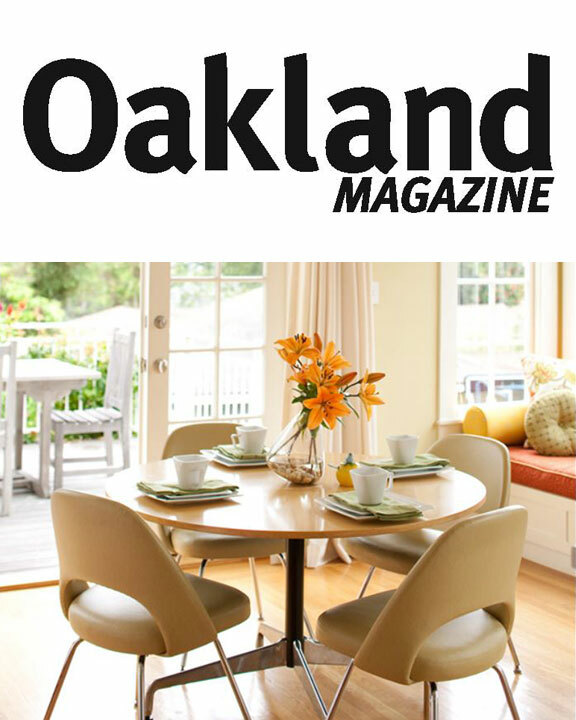 Michael Friedes: I’m currently working on a total redesign of a client’s vacation home in Sonoma, California which has been a lot of fun. It’s a young family with tons of energy, and this is the third home that I have designed for them. 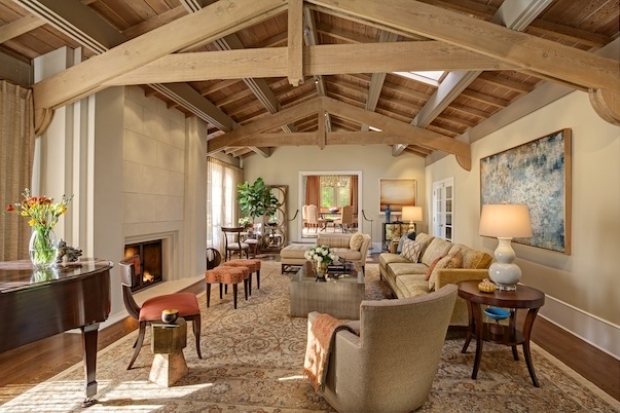 The home is meant for entertaining both intimate gatherings and large events. I’ve been filling the home with a lot of organic materials and special touches that reflect the family’s dynamic and spirited personality. I’m using local handmade glazed tiles from Fireclay Tile to introduce an artisanal element to the home. Olives and pomegranate trees are prominent on the property, and I wanted to bring the outdoors in by giving each bedroom a certain theme. Each bedroom has its own personality, such as the olive room and the pomegranate room. It’s going to be stunning when it’s completed! 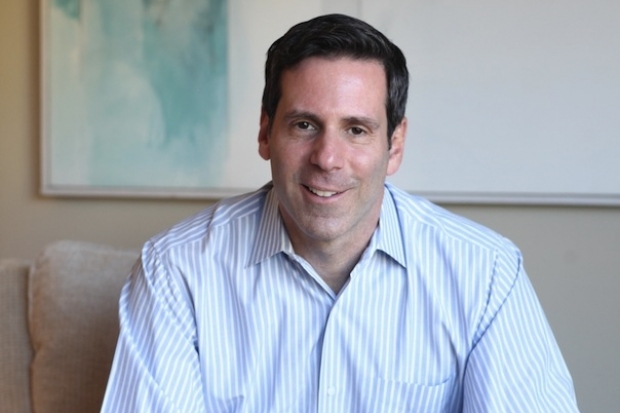 Episode 422: Michael Friedes – Listen to the podcast here! And the winner is Michael Friedes! I love designing custom pieces for clients. More often than not it is the small details that really make the difference, and decorative hardware on a piece of furniture can have a very big impact. Knobs and pulls are the jewelry on casegoods. Generally we choose from the millions of selections provided to us, generally designed for kitchen and bath cabinets. But once in a while, when the budget allows, we may also get the opportunity to design special pulls and knobs for a piece and have them cast in a small quantity. But how exciting is it to know that the hardware you designed will also be on hundreds of thousands of dressers, armoires and side boards, as well as kitchen and bath cabinets? One such lucky interior designer is my friend and colleague Michael Friedes who beat out countless talented designers and took home the grand prize at Baldwin’s national hardware design competition. Designers from around the country were asked to create an original line of luxury kitchen and bath hardware to win their very own Baldwin collection. Michael was one of the two finalists and was chosen as the winner at the International Kitchen & Bath Industry Show in Las Vegas last week. Designs by both Michael and the other finalist, New York designer Kathryn Scott, were on display at the show, and attendees voted on their favorite design. 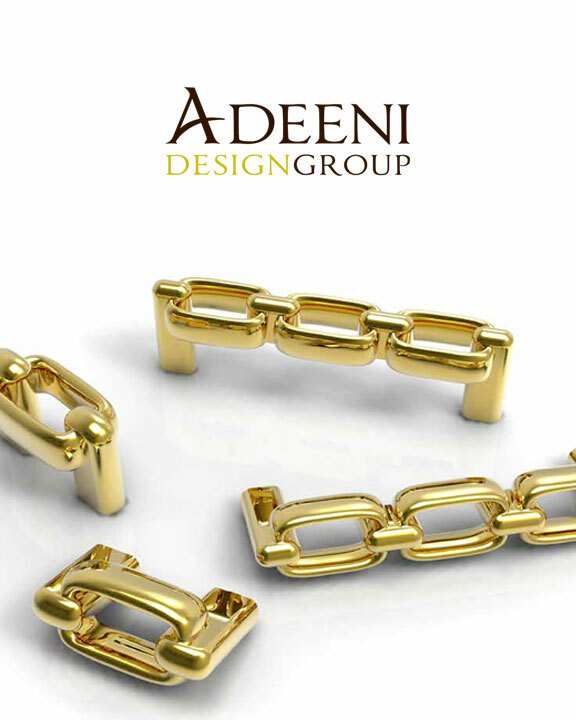 Michael’s inspiration came from jewelry of the 1930s, especially chain link necklaces and bracelets, the kinds of pieces that combine both modern and traditional designs and also have masculine as well as feminine qualities. This does not come as a surprise to me considering that Michael’s father Harry Friedes was a prominent menswear textile designer who was known for his elegance and display of sartorial splendor. I have first-hand knowledge that the apple has not fallen far from the tree, and I am certain that the “Maxwellton” collection will be not only a stunning but also very popular addition to Baldwin’s cabinet hardware collection. The collection will soon be available around the country. The pieces are so fab, who knows, there may be a even a waiting list. 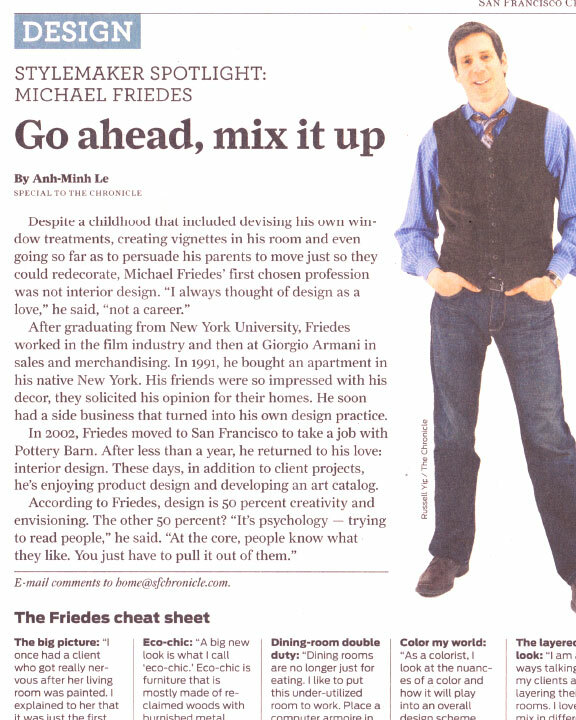 Congratulations to the multi-talented Michael Friedes! After graduating from New York University, Friedes worked in the film industry and then at Giorgio Armani in sales and merchandising. In 1991, he bought an apartment in his native New York. His friends were so impressed with his decor, they solicited his opinion for their homes. He soon had a side business that turned into his own design practice. In 2002, Friedes moved to San Francisco to take a job with Pottery Barn. After less than a year, he returned to his love: interior design. These days, in addition to client projects, he’s enjoying product design and developing an art catalog. 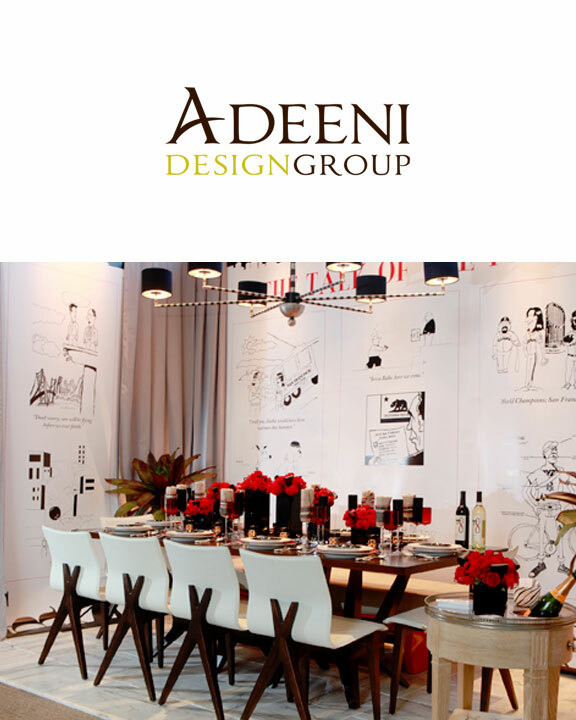 For all my local readers and those planning to visit San Francisco mid November here is a chance to win additional tickets for San Francisco’s most over-the-top and not to be missed design event DIFFA’s Dining by Design on November 16th. 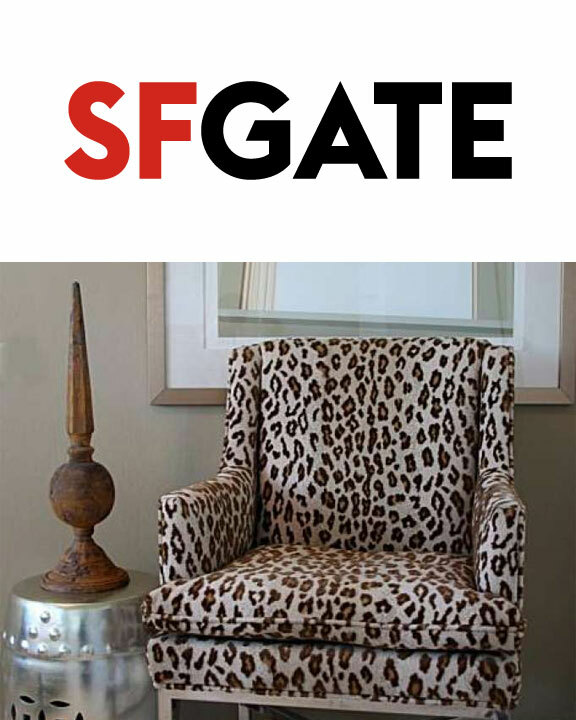 SFLuxe is raffling off two additional tickets for attendees of the Table Hop & Taste event. Check out my preview of the event, and follow instructions on the bottom to sign up for the raffle. Good luck, and I hope to see you all there!